Standing seam is the standard metal roofing installation option, fast becoming the roofing material of choice for homeowners who want a strong, durable, and long-lasting roof. Read on as State Roofing takes an in-depth look at standing seam metal roofs. What Are Standing Seam Metal Roofs? Standing seam metal roofs feature metal sheets that vertically span the roof ridge to eave. Each sheet has crimped edges that form inverted “U” shapes that form the “standing” seams. When installed, these seams are sealed, which prevents water intrusion. 5V-crimp metal roofing is a type of standing seam metal roof that features inverted “V”-shaped crimps. A single sheet has double-crimped edges (forming an inverted “W”) and a single-crimped center, totaling five “V” shapes. The double-crimped seams provide better protection against potential water intrusion. Standing seam metal roofing has the same structural requirements as most roofing systems, and can be installed on existing roof decks. Insulation may be installed between the underlayment and sheet metal, which can help minimize roof noise and heat penetration. Standing seam metal roofs have several unique features that make them an attractive option for homeowners. 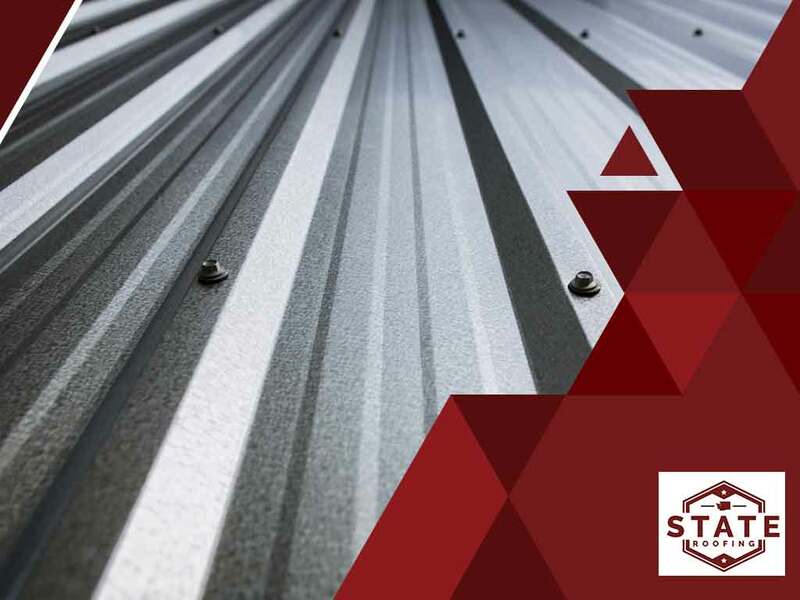 First is their durability; metal roofs are inherently impact-resistant, do not shatter or crack, and, with the right coatings, are resistant to corrosion. Certain options such as copper roofing are corrosion-proof even without add-ons. Each standing seam metal roof has an expected life span of 50 years, which is about twice as long as typical asphalt shingle roofs. Sheet metal is naturally lightweight, which makes it the perfect replacement for existing asphalt shingle roofs. Materials such as slate and tile are comparatively heavier and may require modifications to the roofing structure before they can be installed. Lastly, standing seam metal roofs are energy-efficient, thanks to “cool roof” coatings that can be added after installation. These reflective coatings reduce the heat absorbed through the roof, which, in turn, helps reduce indoor cooling requirements during warm seasons. To learn more about standing seam roofs and other residential roof installation options, call State Roofing today at (360) 205-3100. You can also fill out our contact form to schedule a free estimate. We serve Seattle, WA, and the surrounding areas.